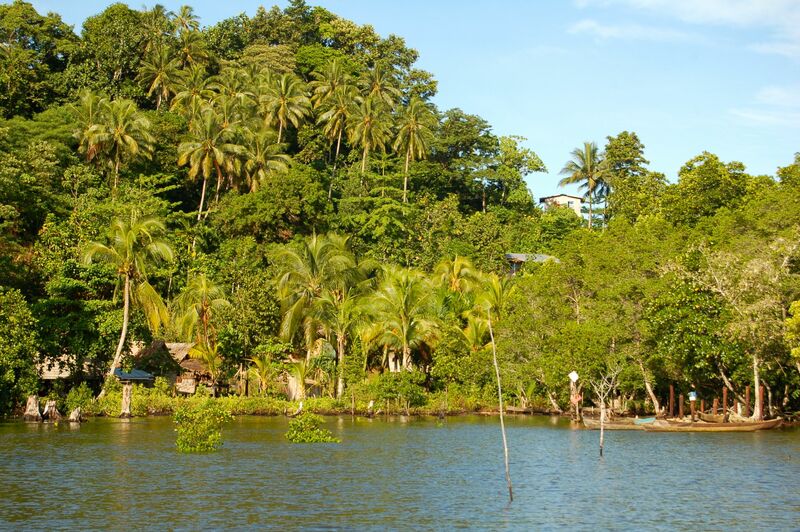 Choiseul province (traditionally named Lauru) is the northern most province of the Solomon Islands. It consists of the main island Choiseul, Vaghena and Robroy Islands, and a number of smaller islets. The centre of the provincial government is on Taro, a small island on the north western tip of Choiseul island. The population of 26,372 people is growing quickly at a rate almost 0.5% higher than the national growth rate. If this continues, it is estimated that the population in Choisuel would double by the mid 2030s. Although the land area in Choiseul is large for the number of people, most of the population live in coastal villages. Sustainable livelihoods in Choiseul Province are closely linked to healthy terrestrial and coastal ecosystems. The majority of inhabitants earn their livelihood from natural resources such as copra, garden crops, seaweed and timber. Ecosystems also provide other essential services such as freshwater, healthy coral reefs, fertile soil, traditional medicines and protection from the threats of climate change and natural disasters. The continued ability to utilise natural resources and ecosystem services are essential to the people's resilience and ability to adapt to both localised human impacts and the predicted effects of global climate change. 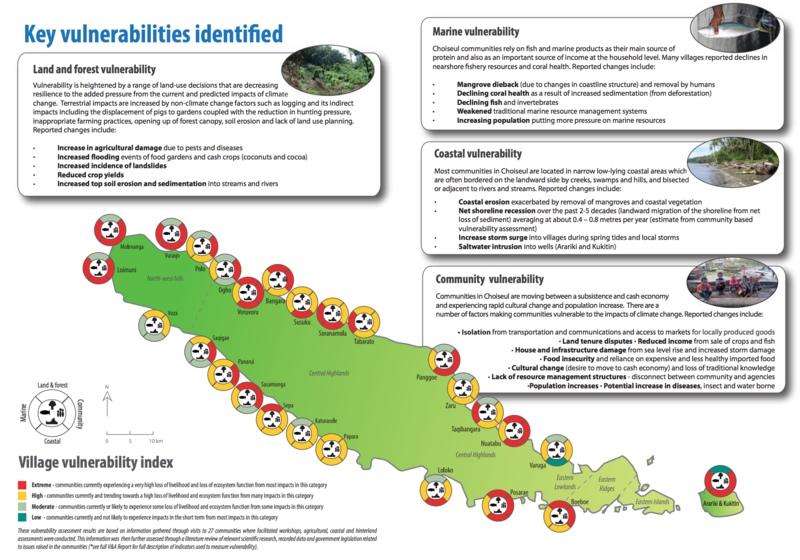 The vulnerability of Choiseul is strongly influenced by non-climate change factors. As a result, climate change adaptation activities in Choiseul cannot be implemented without also addressing the socio-economic issues and ongoing environmental threats confronting the local the local people. To be effective in Choiseul, adaptation planning must be implemented at community, provincial and national levels. Adaptation must also address a variety of inter-related issues including a lack of local development capacity and the challenge of improving subsistence and cash economies in the province. The adaptation options below are a way forward that were identified by the communities themselves and represent initial possibilities to be discussed in detail, costed and designed and implemented in partnership with local communities. Management and protection of inter tidal and coastal areas by: planting coastal trees/shrubs for protection, mangrove reforestation, creating vegetation buffers on river banks and maintaing existing ecosystem functions. Increasing food security and livelihoods by: technical agricultural assistance (crop rotation, crop diversity, agricultural techniques), agroforestry of cash crops and fruit trees, reforestation of previously logged areas with valuable timber species, contour planting and terracing and improved pest and disease control. Protection of water resources by: protection and/or restoration of water catchment areas, riparian and freshwater ecosystem management, increasing water storage capacity, sediment control of freshwater streams and water quality testing. Marine and fisheries management by: coral reef and mangrove ecosystem management, minimising fishing pressure on key species, trials of fish aggregating devices, locally managed marine management areas and monitoring. Increase disaster preparedness by: emergency management procedures for landslides, tropical cyclones, flooding or tsunamis and planning for food shortages caused by disaster events.